An article I wrote on “Recession-Proofing Your Career” for the Jamaica Gleaner can be found at the following link. In the article I describe that if a recession is in the offing, that professionals need to safeguard their jobs by increasing their productivity. Yesterday, I figuratively nailed my own version of Luther’s Theses to the ChangeThis.com website. I can’t claim that it had the same historical significance as other more famous printed texts, but it did feel good. 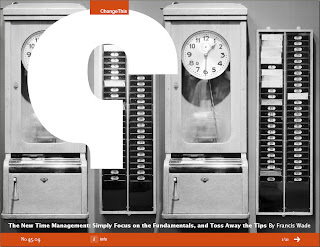 My ChangeThis.com manifesto was published yesterday, calling for a new approach to time management thinking. In the 21 page PDF document, entitled “The New Time Management: Simply Focus on the Fundamentals, and Toss Away the Tips”, I make the point that working professionals the world over have destroyed their productivity and peace of mind by buying gadgets, and buying-into too many tips from other people. Instead, they should be focused on perfecting their time management skills by focusing on the fundamentals of time time management. The manifesto focuses on the first 7 fundamentals (the essentials) without getting into the 4 advanced fundamentals. We’re here to spread great ideas. Got one? ChangeThis is a vehicle, not a publisher. the links below to unsubscribe.